23 ¼ x 20 ⅝ x 5 in. 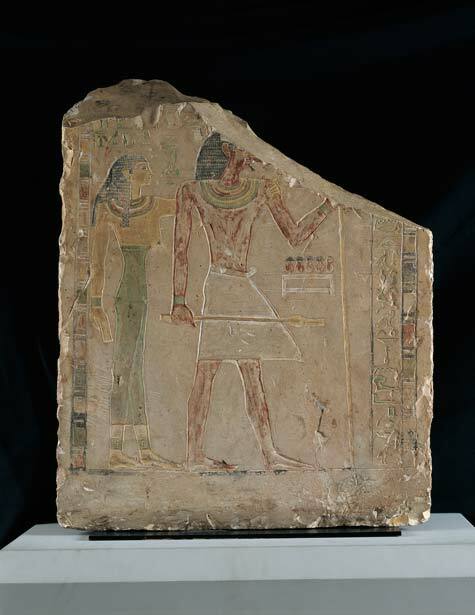 This stela depicts a nobleman named Iku and his wife, Mer-imat. One of the principal purposes of the stela is explained in the vertical inscription located in front of the striding Iku. This written "appeal to the living" asks those who pause in front of it to read the text aloud, providing the deceased with "a thousand of bread and beer, a thousand of beef and fowl, and of everything good, for the high official, the honored Iku." The text above Mer-imat's head describes her titles as "king's [ornament], priestess of Hathor, honored one, beautiful of ornament, overseer of oasis-dwellers." The wealth of the couple is underscored by their fine dress, which includes intricately beaded wigs, jeweled collars, armlets, and anklets. Iku's staff and scepter are traditional symbols of position and authority. This funerary stela is almost certainly from Naga-ed-Deir, a village in Upper Egypt on the bank of the river Nile. The stela closely resembles nearly 100 relief carvings found in the offering chambers of tombs in the vast cemetery at Naga-ed-Deir. Despite its fragmentary condition, the expertly carved surface and the original polychrome are well preserved.